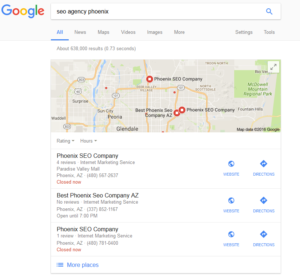 Did you know that inconsistent NAPs (name, address and phone number) can damage your local SEO efforts? Why is Google all about consistent NAP? Think of Google as being your neighbor – he knows all, he sees all. Your kitchen sink has become clogged, and you need the assistance of a plumber. You turn to your Know-It-All neighbor. Your neighbor announces that they know a plumber, and goes to find the business card. He pulls out a plethora of cards, some of them similar to each other. In fact, they may have three or four business cards with the same name but with different addresses and phone numbers. Which one of those cards is the most recent? You could probably look at the design of the card to deduce how long ago it was designed and whether or not it’s current. Even your neighbor isn’t sure which one is the right one. You consider taking every card with different phone numbers to find out which number is the right one. Your neighbor takes the cards back, saying they can’t give you a recommendation unless they’re sure the number is right for themselves. They worry that you’ll never trust them again if you don’t get the right number right off the bat. Looking through the mess of business cards, your neighbor notices another plumber’s business card in the pile. He hands it to you, saying you should be able to get through to them easily. This is what Google wants to do – provide you with the information you need easily and effortlessly. Why is that? Google knows that you may not trust it anymore if you don’t get consistent information. It knows you’ll stop asking questions from it and that you’ll ignore the ads. For Google, this is a bad thing. You get reliable individuals and businesses. The reason your neighbor had problems with a recommendation was that they had no idea which card was the most current. After all, the four business cards had information that conflicted with each other. Each time your NAP local SEO shows up on the web – your website, social media accounts, directory, blog post, etc. – this is a business card in Google’s wallet. If the information is conflicting with each other, Google won’t recommend it. This means your business could miss out on a sale. With a little work though, you can fix the various citations on the Internet. And, the work you put forth will do wonders for your business. Whats Does Nap Stand For? – NAP in local Search Engine Optimization is an acronym for Name Address Phone. When it comes to getting noticed via search engines, you want to make sure that your NAP stays the same throughout the web. Choose what the official NAP is going to be in order to keep your SEO plan working for you. Believe it or not, these minute difference make a huge difference. Make sure to use just one version. Make sure that the official NAP is on your website – on every single page. You don’t want to use one NAP for one page and another NAP on another. Consistency is important here. Several minor directors attain their data from bigger aggregators. Make sure you deal with the aggregator to make a mark with other birds. Sign up on Moz Local, which will cost $84 per year and will run and update NAP information in various important aggregators like Best of the Web, Factual, Infogroup, etc. BrightLocal is another worthwhile paid service, which has a free but limited citation building and correct service. A 30-day free trial is also offered. Yext PowerListings is relatively similar and controls more than 100 local platforms and networks. A quote will need to be requested to find out how much it will cost your business. Their services can often be received via natural SEO company. Be sure to use the advanced Google search tricks from Casey Meroz to reduce the number of listings you’ll have to go through. If there are non-aggregator citation sources (ones you don’t pay for), see how your listing shows up with a free tool such as Moz Local’s Citation Checkers. After that, carry out research for your name, address and phone number to see what kinds of listing show up. Are the NAP details the same as one another? Next PostSEO Results | How long does SEO work take?